Head of Hamas political bureau Khalid Meshaal and the Palestinian ambassador in Tunisia expressed their thanks to the head of the Tunisian Islamist movement Ennahdah Rashid al-Ghannouchi for his efforts in facilitating the Fatah-Hamas reconciliation agreement. In a phone call Thursday, Meshaal updated Ghannouchi about the latest regarding the Palestinian issue. Meshaal discussed Ghannouchi’s mediation efforts between both movements, which lasted for two months. Meanwhile, the Palestinian Ambassador Salman al-Harfi thanked Ghannouchi for his contributions to the achievement of the reconciliation. For his part, Ghannouchi congratulated Meshaal and Al-Harfi for the success of the reconciliation and stressed on the importance of achieving national unity and reinforcing it. He reiterated that division between the people of the same nation weakens the ‘noble cause of the Palestinians.’ He said that there is no choice for the people of the same nation except reconciliation and acceptance of each other. Hamas and Fatah leaders signed a reconciliation agreement on Wednesday in Gaza after seven years of divisions. The GMBDW reported last week that Fatah and Gaza, the two main rival Palestinian factions had announced a reconciliation agreement. Mr. Ghannouchi gave a 2011 Arabic-language interview in which he predicts the end of Israel, a viewpoint which is not surprising given that he has had a long history of ties to Palestinian extremism and calls for terrorism. From 1988-92, the Islamic Committee for Palestine organized conferences and rallies in the United States that featured the leading figures from Islamic extremist movements throughout the world. One example of such a conference took place in Chicago from December 22-25, 1989 and featured Mr. Gahannouchi as a speaker. Its theme was “Palestine, Intifada, and Horizons of Islamic Renaissance” and other speakers included Abd Al-‘Aziz Al’Awda, the “spiritual leader” of Islamic Jihad and Muhammad ‘Umar of Hizb Al-Tahrir, the Islamic Liberation Party. 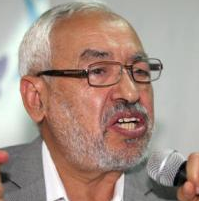 For more on the extremist background of Rachid Ghannouchi, go here.